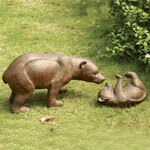 Bear Gifts - Click on an item for more details! This beautiful Bear Double Switch Cover is made of high quality brass with a clear coat that does not require polishing. It is a great accent to any room in your home or office. Makes a great gift item for your friends, family, loved ones, or even yourself. 6" Tall, 5" Wide. Materials: Brass. Set of 2! These "Stock Market" Bull & Bear Bookends are made of brass and marble with stunning detail finish. Brass/Marble, 6.25 inches H.
Set of 2! These "Wall Street" Bull & Bear Bookends are made of brass lacquered on marble with stunning patina finish. Brass/Marble, 7 inches H.
Set of 2! These beautiful Bull & Bear Bookends are made of solid brass and marble with stunning chrome plated finish. Brass/Marble, 7 inches H.
Set of 2! These "Wall Street" Bull & Bear Bookends are made of bronze and wood with stunning detail finish. 7.5 inches tall. Set of 2! These "Stock Market" Bull & Bear Bookends are made of bronze and wood with stunning detail finish. 8.5 inches tall. Set of 2! These "Stock Market" Bull & Bear Bookends are made of solid bronze with stunning detail finish. 7 inches tall.